I think if you're just simple user probably won't be much trouble. But I personally wouldn't get Internet from a power company. In Tauranga, I was with trustpower. After some basic calculation after one year usage, it turns out Powershop saved me at least $600/year even after $400 cashback from trustpower every year. I wouldn't go with Trustpower and reading what others are saying I wouldn't go over to Full Flavour either. Snap or Spark are the providers I'd recommend especially when dealing with UFB. I am personally on Snap on their 200/200 UFB plan and find it excellent, I am also a big user clocking in 5TiB some months (5000GiB) and they never skip a beat. We use Trustpower for electricity and they're fine with that however they're bratty basic when it comes to being an ISP. I've looked at changing a few times to faster (even asked on here if any point) but no one really matched price. And as for the savings I like getting my TECT cheque every Christmas time, it's like enforced savings for Christmas not to mention the massive amount of money that TECT gives to our local schools/clubs feels worthy of supporting of me. Anyway hope that helps when you do get a place. K we have found another place. We are about 200 meters from the cabinet. How can you tell roughly how fast vdsl will be? ask your chosen ISP for a Prequal. that should give you a good indication of speed. Jase2985: ask your chosen ISP for a Prequal. that should give you a good indication of speed. Crosstalk is getting worse on VDSL so it makes it harder to hit the top end. at 200M, assuming line length is actually that you will probably pop over 50 on 17a. Trustpower i believe is locally owned so if you go with them, you should be getting a better rebate when the share dividend is paid out. Thats the only reason I would go with them. Though i dont know much about their history or how the ownership works. Full flavour is a good local isp. Can i do a prequal? or someone else on here do it for me? You phone the ISP you think you'll use and ask them to do it. In Tauranga they have a unlimited Fibre for 12 month contract $69 but its 30 not 100 or 200 so it would probably be easier if i went with VDSL and may get better speeds? I would consider getting fibre as its cheaper and more reliable but our property is the back house, not shared drive but has a concrete drive. What do they normally do in this case? 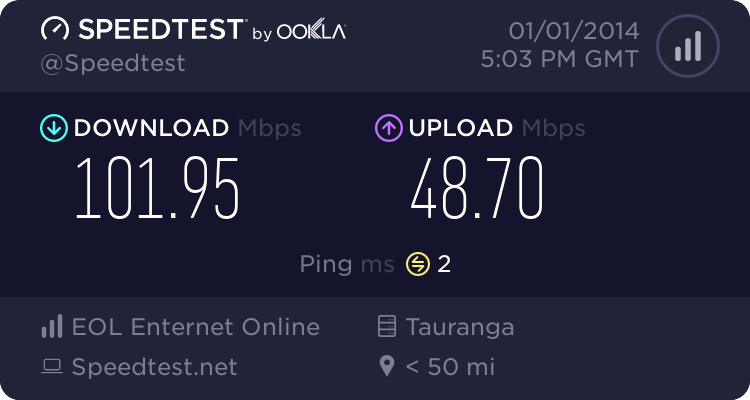 If you're in Tauranga/Mt/Papamoa area (infact anywhere that you're part of the UFF network) then the speed will be 50/20 which will be almost certainly faster than VDSL. Suggest you ask them if they can give you VDSL while they're organising the fibre install - they should be able to arrange this at no extra cost as they use the same netcomm router for both services. if you want more than that go with a different ISP, there are plenty out there.